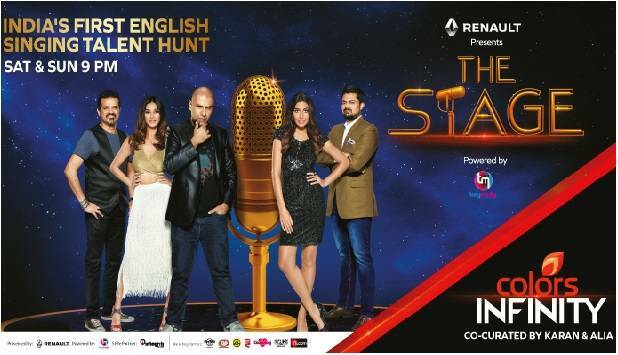 COLORS INFINITY, takes your TV screen to an all new horizon with the first ever home grown English language singing show – The Stage, premiering on Saturday, October 10th, 9 PM. Hosted by the beautiful Shibani Dandekar, the groundbreaking new show has roped in four highly dynamic and eclectic music maestros as judges, who will thresh out the best from among 20 talented artists, and hand over the opportunity of a lifetime – a record deal with Universal Music, a 10 city tour along with a mentorship program to give the winner’s career that extra push. Our fantastic four, each brings a unique quality to the table. A veteran in judging music reality shows, Singer and Music Director, Vishal Dadlani, is the seasoned and experienced mentor and judge. He says, "I think having a show like ‘The Stage’ is a benchmark for Indian Television. It is the first time the larger section of India will get to see the kind of talent there is in English western & pop music in India. I think it is going to redefine music in this country". The Suit of the show, MD and CEO, Universal Music Group South Asia and EMI Music South Asia, Mr. Devraj Sanyal, has the know-how and command of the business. He says, "What drove me to be a part of The Stage was its unique format. Never before has India witnessed a platform to promote English singing talent. The Stage has given me a chance to reveal the hidden gems of our nation from parts of India one can never even imagine! The launch of The Stage marks a landmark in the Music and Entertainment industry". Renault, title partners of the show, are equally excited about the new venture, Virat Khullar, Marketing Head Renault India, said, “The Stage is a fresh new concept in Indian Television which is bound to change the scope of entertainment in this country, and this belief in the show is the foundation of our partnership with COLORS INFINITY. We are glad that we can be a part of this huge transformation of English entertainment in India”.